I identify Calvin as “partly” Classical 2K because he did in fact speak of two kingdoms (or “two regiments;” see Institutes 3.19.15; 4.20.1-2), even though he devoted less attention to it than Luther. However, he did not conceive of these two kingdoms as two compartmentalized spheres of temporal life (pace Radical 2K). Rather, like Luther, he spoke of a distinction between the visible/temporal/outward and the invisible/spiritual/inward, with the purpose of maintaining Christian freedom in the spiritual realm while still affirming our continuing obligation to temporal authorities (whether civil or ecclesiastical). Thus, for Calvin the institutional church and the state belong to the same kingdom. Regarding the Classical 2K understanding of “our souls” as the exclusive realm of redemption, Luther clearly taught it, and Calvin “partly” did. Jason Lief has explained how Calvin inherited medieval conventions of speaking about “soul” and “body” in almost Platonic terms, where only the soul is the seat of the image of God (see Inst. 1.15.2-4). But this language must be balanced by Calvin’s language elsewhere about redemption involving the restoration of the whole created order, including our present bodies (see Institutes 3.25.6-8). 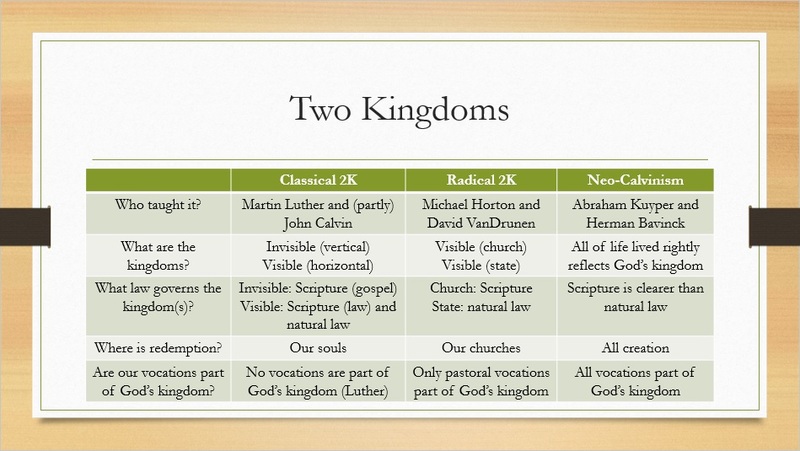 Neo-Calvinism is in fact a variant of “two kingdoms.” Both Kuyper and Bavinck wrote at length on the subject, although more along the lines of the classical version than the radical version (only R2K identifies the visible church with the kingdom of God). However, they placed greater emphasis on the continuity of creation and redemption—their motto was “Grace restores nature”—and embraced a more active role for the church in applying biblical norms to public life (“church” here being defined more broadly as the body of Christ or “church scattered,” rather than the narrower institutional church or “church gathered”) . See Cornel Venema, “The Restoration of All Things to Proper Order: An Assessment of the ‘Two Kingdoms/Natural Law’ Interpretation of Calvin’s Public Theology,” in Kingdoms Apart: Engaging the Two Kingdoms Perspective, ed. Ryan McIlhenny (Phillipsburg, NJ: P&R, 2012), 10-18. For example, Luther wrote, ““For baptism does not make men free in body and property, but in soul” (Luther’s Works 46:51). And elsewhere: “Here on earth a Christian lives according to the body. Like any other man, he eats and drinks, works and manages his affairs. But his heart, mind, and thoughts are on his eternal salvation in heaven and on his certainty in this hope” (LW 12:104). Jason Lief, “Is Neo-Calvinism Calvinist? A Neo-Calvinist Engagement of Calvin’s ‘Two Kingdoms’ Doctrine,” Pro Rege 37.3 (March 2009), 2-4. Gustaf Wingren writes, “In heaven, before God, vocation has as little to contribute as do good works. Good works and vocation (love) exist for the earth and one’s neighbor, not for eternity and God. God does not need our good works, but our neighbor does. It is faith that God wants. Faith ascends to heaven. Faith enters a different kingdom, the eternal, divine kingdom, which Luther considers just as evident as the earthly realm, with its offices and occupations through which God carries on his creative work. In the heavenly kingdom Christ is king and there the gospel alone rules: no law, and therefore no works.” Wingren, Luther on Vocation (Wipf & Stock, 2004), 10. Cornelius Plantinga writes, “The Calvinist and Reformed concept of the commonwealth [i.e. the realm of vocation] is linked to the doctrine of the kingdom of God by being the kingdom’s slowly realized, still imperfect, but proleptic expression.” Plantinga, “The Concern of the Church in the Socio-Political World: A Calvinist and Reformed Perspective,” Calvin Theological Journal 18.1 (1983), 203. For a more thorough treatment of the differences between Luther’s and Calvin’s views of vocation, see John Barber, The Road from Eden: Studies in Christianity and Culture (Whitefield Media, 2013), 247-262. Bavinck, “Het rijk Gods, het hoogste goed,” 49. Quoted in Nelson Kloosterman, “A Response to ‘The Kingdom of God is Twofold’: Natural Law and the Two Kingdoms in the Thought of Herman Bavinck by David VanDrunen,” Calvin Theological Journal 45 (2010), 169. Ibid; Abraham Kuyper, Pro Rege 1.22 (currently available only in Dutch).